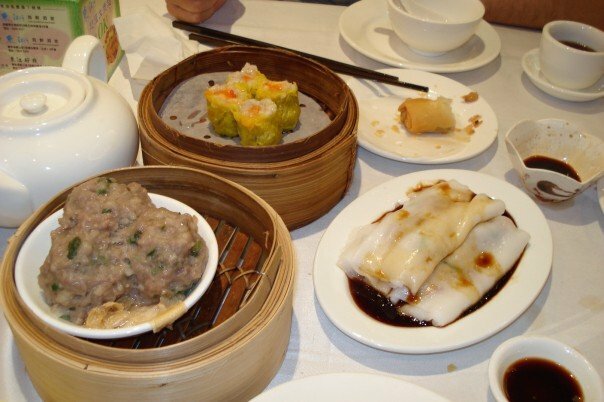 Dim sum… can’t get enough! One of the greatest joys of living in Hong Kong is the orgasmic dim sum restaurants. This morning we woke ourselves up early to go over to Causeway Bay to the East Lake Seafood restaurant. We first discovered this place way back in April when I came for my job interviews because it was just around the corner from the filthy hovel.. I mean hostel… where we stayed. East Lake serves the most amazing and cheap dim sum from 7 am and 12 am. Even now, we keep returning to this place for the excellent food. A typical dim sum restaurant looks like this — a huge, ornate banquet hall with red curtains and gold dragons, tacky crystal chandeliers, round tables with white table clothes, and waitresses who often don’t speak any English. Chinese people are incredibly hard working, but also very family oriented, so dim sum is a chance for the whole family to have a much deserved break together. When they go to the restaurant they take newspaper, magazines, books, and even video games (teenagers) and spend HOURS sipping jasmine tea, ordering dim sum, reading, and just generally chilling out. 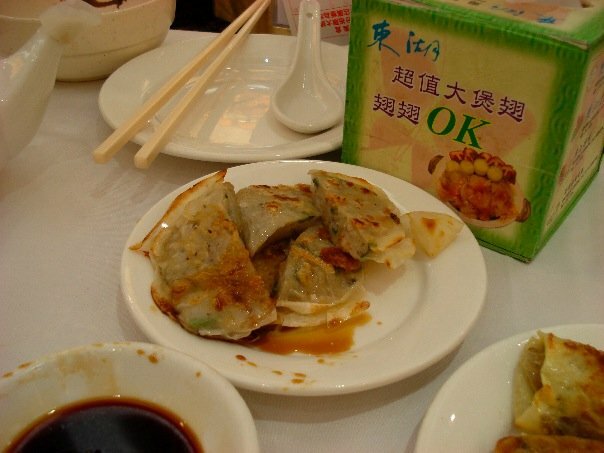 Going out for dim sum is a whole-morning activity…. and I love it! So, you get your strip of paper with the list of items, and as you order the food and the waitress brings it, they put a little stamp next to what you have eaten so that they can keep track of your bill. Bit by bit the waitresses bring the bamboo baskets, full of dimsum goodness, and place it on your table. So good. Seriously. I personally think that to truly enjoy a Hong Kong dimsum breakfast, you need to devote at LEAST two hours. It is a great way to spend a weekend morning, and if you are a ‘gwailo’ like me (foreigner), people often watch you curiously as you masterfully manipulate your chopsticks. And the most amazing part is that it doesn’t burn your wallet! Today we ate at least 12 dishes and barely spent $25 US. Incredible. Well, enough with the talk, without further ado, I’ll get down to the pictures! Bon appetit! (I guess I should learn how to say that in Cantonese….) Note that it was kind of hard to remember to take pictures when we were so hungry! That is why you see chopsticks in the pictures attacking the dimsum. Or some of the dimsum might have been bitten already. Sorry. Oops. We were short on patience. That food looks sooooo good! I want to come out for dim sum. I can’t believe they eat it at 7 in the morning though!